Six months after bestselling author and travel journalist Jo Piazza got married she learned she had a rare form of muscular dystrophy, one that could begin to erode her muscles and make it difficult to walk in about five years. She was just 35. Her new husband Nick suggested they climb a mountain while she was still strong. They decided to make it a big one. The following is an adapted excerpt from Piazza’s witty, charming and sometimes heartbreaking new memoir, How To Be Married, where she traveled the world (20 countries on five continents) during the first year of her marriage to crowdsource advice about what truly creates a better happily ever after. We made a pact. If one of us couldn’t make it up the moun­tain for any reason, the other would keep going. “Seriously,” I said to Nick. “If I get tired or hurt or sick or if I see a kitten or a small monkey that I think I need to rescue, you keep going.” I knew if anyone was going to fail to make it to the top of the mountain, it would be me. “We’re not getting another pet. We’ve talked about this,” Nick said. “And if I can’t make it to the top, if I fail, then you keep going too.” Nick wasn’t going to fail. He doesn’t fail at anything. The concept of actually climbing Kilimanjaro and not just talking about it didn’t become real until we stood at the base of the mountain. “It’s much bigger than it looks on postcards,” I said, gazing at the vast cloud- covered mass of earth looming in front of us, so tall we could only see a small portion of it. Looking ahead to the steep and rocky inclines made me wobbly and anxious, and when I concentrated on the looming mountain I became convinced I’d never get over the next ridge. Instead I inspected my feet, focusing on one plodding in front of the other. When my limbs ached I softly chanted to myself so no one else would hear me: “Your body is strong. Your body is strong. Your body is strong. Thank you for being able to climb this mountain. Thank you. Thank you. Thank you.” I’d frequently stop and pretend to take pictures with my phone just to catch my breath. That’s the reason we were making this climb, to prove I was still strong. That my body still worked the way I wanted it to. A month earlier an uncomfortably chirpy genetics counselor named Violet told me I had a mutation on my fourth chromosome, the same genetic anomaly that caused the muscular dystrophy that was killing my father. My dad, once a tough and virile guy who loved golf and dancing with strangers, first experienced symptoms of the disease right before he turned forty (I was 35) and the progression of his condition was long, slow, and excruciating. By the time I got married my dad was confined to a hospital bed in the living room of my parents’ house, unable to walk, stand or breathe on his own. For my mother, the lines between wife, caretaker, and servant became invisible, a fact that eroded their marriage as well as her own mental and physical health. My mother’s life, the life of a dutiful but miserable caretaker who changed the diapers of an adult man and spoon-fed her husband with barely concealed disdain, wasn’t something I wanted for Nick — not now, not ever. Panicked in the days after my diagnosis I told my new husband — a man who loved riding bikes, hiking, skiing, climbing things, and doing anything with a healthy pair of legs — to leave me so he could have a normal life. In that moment, I felt ruined, damaged, and powerless. “You’re ridiculous,” Nick stated with his trademark Midwestern certainty, sitting beside me and placing one of his bear paw hands on my back. His default is calm and cool, while mine leans toward hysterics. “I’m honest. I’m being honest.” Stop, I thought. Just stop. But I couldn’t. My eyes stung, my voice shook and my heart slammed into my throat. That’s when Nick started talking about doing something big and scary and hard and physically taxing on my still fully intact body. “We could climb a mountain,” he suggested. When I suggest things, I Google them and talk about them and rarely do them. When Nick suggests something, he means it. My father hadn’t left his hospital bed in six months. He could no longer breathe on his own, and without the aid of an oxygen machine he would suffocate. He wore diapers for his constant diarrhea and was frequently nauseated and stricken by intense bouts of pain and headaches that made him black out. It wasn’t lost on me that the symptoms of altitude sickness I could experience on Mt. Kilimanjaro mirrored his daily existence. 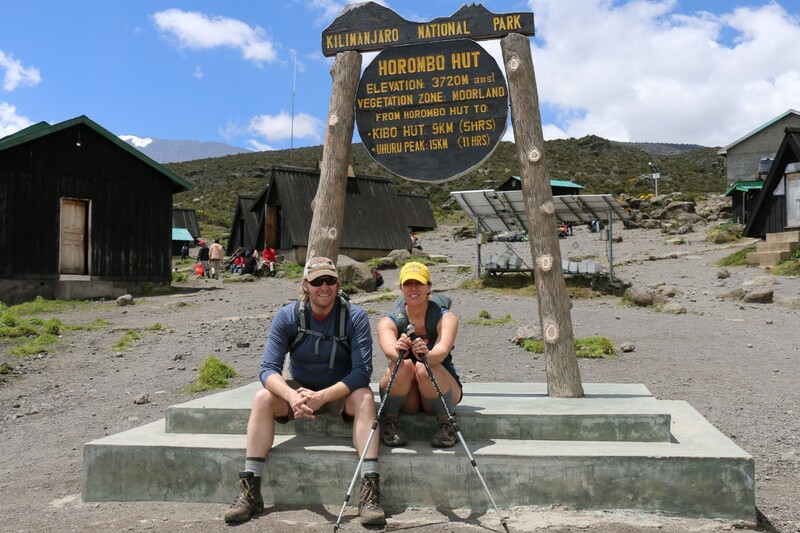 At 19,341 feet, Kilimanjaro is a very, very tall mountain. And while the climb to the top isn’t technically difficult (you don’t need an ice ax or ropes or anything), it’s a strenuous four-day challenge that is incredibly taxing on the body. About 25,000 people climb the mountain every year, and of those only 40 percent make it to the summit. Nick kept pace with me. He carried my pack and stole a salt shaker from the mess hut so I would stay hydrated as well as napkins from the other trekkers so I’d never run out of toilet paper. “Pole-pole,” Nick insisted to the guides. It meant “My wife needs to go slow” in Kiswahili. Picture the movements of an arthritic septuagenarian; that was the pace my body preferred. We fell in step with a group of geriatric Japanese wearing ski goggles and face masks. On the path Nick invented a whimsical song to keep me going. The words made no sense but it had a rhythm that matched the click, click of my walking sticks. By the close of day three, going pole-pole, I felt a surge of adrenaline and pride. We’d ascended thousands of feet, slowly but surely, to land at an altitude higher than I’d ever been. My body was strong. The highest summit of Kilimanjaro is called Uhuru, which translates to freedom. On the fourth day of our climb it was plainly in sight, so close we felt like we could reach out and touch it. I ran toward it, spreading my arms and doing a silly dance through a grove of giant groundsels, alien-looking trees found only on Kilimanjaro above fourteen thousand feet. We were in the alpine desert, so close to the final ascent, when Nick felt the effects of the altitude in new and severe ways. It began when he hallucinated that he saw a fish smiling at him from on top of a very large boulder. “He’s laughing at me.” He pointed. “That fish is mocking me.” I brushed it off as another of his attempts to make me giggle in an uncomfortable situation. His head began to throb and his stomach heaved. I sat in the sand and pulled Nick down beside me. I could smell myself and wondered if he could too. In the dark on night I’d accidentally dropped my deodorant and other toiletries down a toilet that was more of a hole in the ground. We hadn’t showered in four days and the sweat on our bodies had frozen, unfrozen, and refrozen over and over again. “I have to go down,” he said. “You don’t. You’re fine. We’ll wait it out. Oregano, oregano. Gotta keep it moving. Gotta keep it moving.” I handed him the salt shaker from my pocket. “Is he dead?” I asked our guide. I couldn’t tell if he was lying. I placed my hand on Nick’s arm. “Are you sure?” I looked at him. I saw him vulnerable for the first time since we’d met. I could have kept going. Thanks to Nick’s slowing down, carrying my pack, and sneaking me extra food, I finally felt strong enough to make it to the summit. My ego wanted me to keep going, but I wasn’t about to abandon my sick husband on the side of a mountain in a foreign country, scared and alone. “I feel like a chump,” Nick said, wincing from the pain and closing his eyes. “I’ve known a lot of chumps and you’re the best one I know,” I said and stroked his back. For the first time since we’d been married I realized that part of choosing to spend your life with someone was choosing to take care of them. Genetics didn’t have to dictate our destiny. We could choose how to face the future. Our lives didn’t have to mirror my parents. Adapted from HOW TO BE MARRIED: What I Learned from Real Women on Five Continents About Surviving My First (Really Hard) Year of Marriage. Copyright © 2017 by Jo Piazza. Published by Harmony Books an imprint of the Crown Publishing Group, a division of Penguin Random House LLC.